Home Headlines Christopher Nwandugo wins N500,000 As First Jackpot winner for Give’n’Take indoor Game of Best. Christopher Nwandugo wins N500,000 As First Jackpot winner for Give’n’Take indoor Game of Best. Half a Million naira Cheque was yesterday presented to Mr Christopher Nwandugo as he emerged the first Jackpot winner for Give'n'Take indoor Game of Best. The Week 23 National Jackpot Draw saw Numbers 03-15-11-30 and 26 drawn as National Jackpot winning combination numbers, while Jigawa the New World state emerged the State Powerball. A total of 705 players won prizes on the off line platform using POS with our agents nationwide, while 210 players won in the online platform, using the mobile app and web play making it a total of 915 winnings. So far Over 20940 persons have won other prizes at the Weekly National Jackpot Draw, although no player has won the National Jackpot prize of 34.4 Million naira. During the Game show, Yung6ix took the National Jackpot studio by storm as he performed his Plenty Money, Money is Relevant and Before I Go Broke, just as Nigerian born Canadian based visual effects artist, Kenneth Ugochukwu Ogbo made his first appearance at the Jackpot studio by pressing the Jackpot Red button. Bear in mind that 'Ken' is one of Hollywood visual effects world artist that worked on many blockbuster films including Pan, Fantastic Four, Chappie, The Martian and Tarzan. Four lucky people in the audience smiled home with 20,000 Naira each in instant audience game with winning ticket numbers of 713, 766, 729 and 755. Play is available through any of our channels which include, MPOS via our agents nationwide, our mobile app, downloadable at www.gntbig.com, or via our web play. In addition players can play through Quickteller and ATM machines. 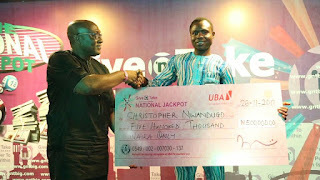 Give'n'Take aside the National Jackpot, offers a variety of other instant games like Dream, Crown, King, Climax and Best, which Mr Christopher Nwandugo from Karamajigi in Abuja just won the first Jackpot Prize of 500,000 naira.